Combat Commander is a wargame for the modern boardgaming age. Traditional hex and counter wargames have often been seen as the domain of only the hardened gamer who loves poring over dice roll modifier charts and calculating the optimum strategy for success. Combat Commander gets away from the dry, traditional method of doing things and uses a novel card management approach to playing the game which makes it fast, fluid, frantic and fun. Gameplay is very simple, on your turn, play a card, that card will be one of several orders such as assault, move, fire etc. Then activate some units to carry out that order. Then carry out that action. Repeat this process for the number of actions you are allowed (varies by side and by scenario) and then pass play to the other player. Alternatively, you can forgo your entire turn and discard cards up to your command limit (this varies by side and represents the better command structures the various participants had). At the end of your turn you draw up again. Then it’s the opponents go, who does the same. The real novelty here is baked into the cards themselves. Every card has multiple uses, you use it on your turn for an order, or you could use it during your opponents turn for a reactionary order (like, say, opportunity fire). Knowing when to play cards for their orders and when to hold them to interrupt your opponents plans is a vital part of the tactics in playing a game of Combat Commander. Additional to the two uses by the players, every card also has a pair of dice printed on the bottom. Whenever you need to resolve something by dice throw, you flip a card from the top of your deck and check the dice results there. Lastly, some dice results have what are called trigger boxes around them, which will cause events such as incoming sniper fire or other random chaos which so often happens in a heated engagement. Combat Commander is chaotic, yes, but that’s one of it’s charms. The game is very much about having a strategy and trying to manage your deck of cards appropriately to make sure your desired result comes out, whilst denying your opponent the opportunity to reach the result he wants. I first got Combat Commander about a year ago. By that time it was considered and older game. Although not my first Game by the publishing company GMT games it most certainly opened my eyes into what war gaming is all about. You see I have and play Memoir 44 which my wife loves but I don’t feel that I am playing a war game. It just does not drive my interest to read on the battle or get involved emotionally with my units on the map… This is where I think lays the big difference between this game and other lighter tactical war games. To my review :). Game Components: Combat Commander is at its heart designed after war games of the past. Chits will represent your leaders, squads and information that needs to be remembered. Alot more information can be represented on these cardboard counters which allow for a more in depth look at how these men were equipped for the war. Important stats will include movement, firepower, range and troop morale, leaders have command radius which helps you activate many units under one command hence replicating real life decisions. All scenarios which come with Combat Commander Europe will play out on nice quality paper maps. Each map will depict all the scenario terrain which is very appealing to look at. Each hex has significant space to fit counters side by side. Two player aids and 3 Order of Battle card stock sheets will come in the box. The player aids will give you easy to follow tables when it comes to the various stages of play. The order of battle sheets help with reinforcements during the game and on the flip side can be used when designing your own scenarios. Overall very nicely done. At its heart Combat Commander is a Card Driven game. All actions and rolls of the dice are done trough the cards. Therefore if an event has happened a card must be drawn and the results will be applied. During a game you will not see everything that can happen during which is a very nice thing. In some cases you might not have a blaze break out in a game for quite a few games. Each Faction will have its own deck and the basic three are Americans, Germans and Russians. The cards are made of thicker material and I find them hard on my hands to shuffle unless you sleeve them. Overall the photos on the cards give a strong theme to the game and immerses you into the 1940’s. Rules and Application: The rule book is written in the basic war game style using a numeral system. I have grown used to using this system and GMT and company have done a wonderful job on this rule book. During play if I need to find anything I can easily locate its answer in the book. Pleasantly represented I found this book a joy to read. The playbook has all the scenarios needed to play the game plus a section on how to make your own scenarios. The DIY section alone is awesome and with give you unlimited play ability with this game. Learning the rules can be a challenge if you are used to a nice color rules manual with lots of pictures, Take you time and read through it a few times the game is worth it. Play Experience: Truly this game will have you remembering key moments of intense action weeks after you play it. This is a big strength to a game like this and is a path for someone to discover what these war gamers feel as they let the game tell a story. During the game you will play cards to give commands to your troops in hopes of securing your victory conditions. Most of the time this is capturing and holding certain objective spots on the map. As you command your troops you have to hope that your enemy is preoccupied or is told to hold fire as you advance across barren terrain. Events such as sniper fire, Blazes,Fog,Wind,Interrogation,Jammed guns, and much more. Players will play cards from their hand to do these actions but may have no choice but to waste their turn and discard. Careful though as if your deck runs out the scenario defender will get a victory point. There is so much more to explain here so I have just touched the surface. It really is not that difficult game rules wise but is strategic depth its is leagues deep. Overall I love this game and have had some great experiences with it and have made some good friends while playing it. 10/10 for me. Give yourself at least three plays before you discard it aside. I hope more gamers can bust this game wide open and enjoy all its nooks and cranny’s. Combat Commander is a card driven WWII boardgame. The cards are used to perform Orders and Actions as well as die rolls. There are many expansions out for this game and each scenario can be played more than once with different outcomes due to the randomness of the cards and certain random events that will occur during a game. So in my opinion, the game does have a high replay factor. Each scenario has an objective and sometimes each player has either an open objective (visible to all players) or a secret objective (only revealed at the end of the game and not visible to all players). The time it takes to finish a game of Combat Commander varies because the turn marker is not directly controlled by the players. Just because a scenario has less turns than another scenario does not necessarily mean the game will end sooner. The turn marker advances when a “Time Trigger” card is drawn as a random event or a player’s draw deck is empty. The quality of the game components are very good although the map is not mounted, but is a paper map. I would suggest to have the map laminated or perhaps place a piece of glass over it to prevent it from wearing out while playing the game. There are no dice in this game because the cards are used for die rolls. Is this game fun? Well this depends on the individual. To some extent your planes during this game are somewhat restricted by the cards you have available to you. There will be times where you will not be able to move or shoot and only skip your turn in order to discard and draw new cards, while your opponent smiles at you and drops artillery shells on your poor hapless soldiers turn after turn. Oh the horrors of war! Although there are no vehicles in the game, I would not let that deter me from trying the game. What it lacks in vehicles it makes up for in other ways. As for myself I love playing this game. This is probably because I love playing most games, but mainly because it’s fun! I’ve forgotten how many times while playing this game that I was playing a lost cause and suddenly when I least expected it, Bam!!! I was in the lead. The game can change at a moment’s whim and, that’s fun for me. So give this game a fair try and decide for yourself if this game is for you. You will either be saying “Please Please Please, can we play Combat Commander?” or not. 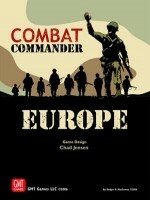 Add a Review for "Combat Commander: Europe"